"Texas Democrats have welcomed Latino voters, while Texas Republicans have alienated them at every opportunity." "I look for Republican primary voters to continue their resistance to Latinos on their primary ballot, such as Quico Canseco, running to be the Republican nominee for Congressional District 23, and Bill Flores, running for his party’s nomination in Congressional district 17. Both men are serious candidates, but I believe they could either lose outright, or will struggle going into their run-off elections." Well, it looks like perception of the Republican Party is wrong and her race baiting tactics did not work! 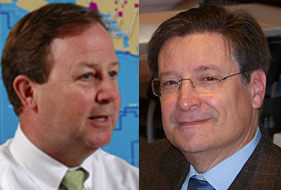 Both Bill Flores and Francisco "Quico" Canseco, who were both in the Primary Runoff Election for their respective districts, have won the bid for GOP candidate and will be running against their district's Democratic incumbents in the November 2010 Election! Bill Flores will be running against Chet Edwards and Francisco "Quico" Canseco will be running against Ciro Rodriguez. Let's give these two GOP candidates support, so they will be ready to kick those Democrats out of office in November!